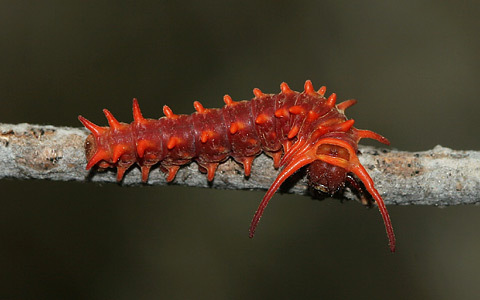 I observed this brilliant scarlet-colored Pipevine Swallowtail (Battus philenor) caterpillar crawling on a dead twig in the Molino Basin Campground in the Santa Catalina Mountains near Tucson in July of 2005. These bizarre-looking caterpillars darken as they grow, eventually becoming black with fleshy, scarlet protuberances. Pipevine Swallowtail caterpillars feed only on plants in the genus Aristolochia (Dutchman's Pipe), and the caterpillars accumulate the powerful toxins found in these plants. These caterpillars are not only toxic, they are also foul-tasting and their scarlet coloration is a warning to hungry birds to stay away. Watson's Dutchman's Pipe (Aristolochia watsonii) is the only Aristolochia species that occurs here in Tucson, and the presence of this Pipevine Swallowtail Caterpillar in Molino Basin Campground tells me that Watson's Dutchman's Pipe vines definitely grow there. I have never seen these inconspicuous plants with their oddly-shaped, musty-smelling flowers before, and the next time I visit Molino Basin Campground I will definitely search for them. Update: I finally managed to find several Watson's Dutchman's Pipe (Aristolochia watsonii) vines in Molino Basin Campground. They are not uncommon, just rather inconspicuous, so I hadn't noticed them before.